The Canyon Pintado Historic District is listed on the National Register of Historic Places and is located in northwest Colorado in the Douglas Valley south of Rangely. Canyon Pintado (Painted Canyon) has been occupied by prehistoric people for as long as 11,000 years and was repeatedly visited by a variety of cultures throughout its long history. One culture that left a visible mark on the Canyon was the Fremont. The Canyon provides the largest concentration of Fremont archaeological sites along the Dinosaur Diamond. More than fifty archaeological sites in the Canyon Pintado District were the handiwork of Fremont-age peoples. The Canyon Pintado Historic District features eight marked sites along Highway 139 south of Rangely. 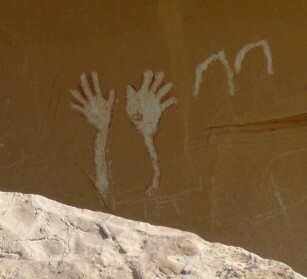 The sites feature petroglyphs and pictographs on the sheer sandstone walls that were left by Fremont and Ute civilizations long before Europeans explored the West. 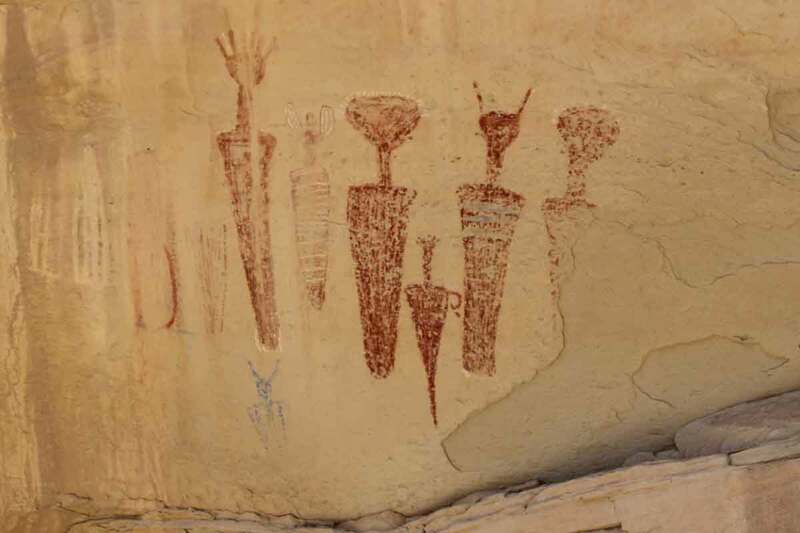 Why did the Native Americans inscribe petroglyphs and paint pictographs on the sheer sandstone walls in so many places around Rangely and the West? Were they doodle, religious scripture, boundaries, events, hunting maps, memories, leaders, ghosts? No one knows for sure, but studying these mysterious messages from civilizations long past may trigger your imagination and give you a feel for the history that you probably can't fully experience in any museum. Rock art was applied to the stone in two ways. A petroglyph is a drawing that has been "pecked", or rubbed into the rock. The artist pecked an image by repeatedly tapping on the rock surface with another stone. A pictograph was painted onto the rock using pigments from animals, plants or minerals. In rare cases, early artists would use both methods for a single image. Be a friend of the past. Do not walk on boulders with Rock Art or dislodge any rocks from canyon walls. Rock Art is a fragile and unique vestige of our Native American Heritage. Time and weather have caused much of the treasure to disappear but the greatest destroyer of all is the vandal who defaces, chalks, and chips. Cherish and preserve this legacy that is hundreds and, in some cases, over a thousand years old. Principal rock art in the Rangely area is located along two corridors; Canyon Pintado (State Hwy 139) and Dragon Road (County Rd. 23, White Ave. in Rangely). The local rock art originated from two peoples; Fremont and Ute. The Canyon Pintado Historic District comprises eight marked sites along State Hwy 139. By starting in Rangely, travel east on Highway 64 then turn right on Highway 139 and travel south. Sites are well marked with roadway markers. For a self-guided tour, be sure and pick up a brochure when you're in town or click on the link below for a printer friendly map.